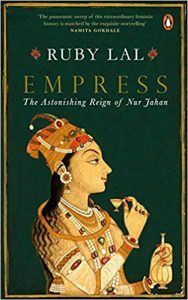 Empress :The Astonishing Reign of Nur Jahan comes after a host of other works by Ruby Lal on themes such as domesticity, women’s writing, harem, imperial household and so on in pre-colonial South Asia. Her previous book, Domesticity and Power in the Early Mughal World (2005) opened up new vistas of looking at the Mughal harem, domestic space, and the feminine world, through the prism of power. Although it was not based on any particular persona, Nur Jahan was highlighted for her ‘centrality’ which became possible, ‘only in the track of the powerful women who had gone before her’ (Lal 2005, 224). The Empress, as the title suggests, puts the spotlight on Nur Jahan as a political figure. The book delineates itself as creative non-fiction, and a biography at the outset, by attempting to also explore the oral narrative of ‘what exactly the public knows (or think it knows) about Empress Nur’ (p. 6). It is Nur Jahan not just as the Mughal empress who is invoked, but also a fascinating subject of South Asian cinema, theatre, comics, historical romances in multiple languages, and popular memory. However, the book does a lot more. The book is divided into sixteen chapters—‘Queen of Queens, An Introduction’, ‘Miracle Girl, Al-Hind’, ‘The Cupolas of Chastity and the Perfect Man’, ‘The Wak-Wak Tree’, ‘The Mirror of Happiness’, ‘Grave Matters’, ‘A Key for Closed Doors’, ‘Ascent’, ‘Wonder of the Age’, ‘Veils of Light’, ‘The Light-scattering Garden’, ‘Fitna’, ‘The Rescue’, ‘Angel of Death’, and ‘Beyond 1627, An Epilogue’. It follows a chronological narration along with many interesting deviations, trying to connect the dots of historical conjunctures of Nur Jahan’s life. Lal also provides elaborate biographical details of prominent figures in the book, a few illustrations, notes on transliteration and terminology, and a detailed analysis of the sources. This brings us to the pertinent question Empress deals with—how to write women’s history in pre-colonial (even colonial) South Asia? History and writing of history in pre-modern South Asia has been almost exclusively a male domain. The abundance of court chronicles, anthologies, biographies, etc., do not account for the absence of women’s voices or their histories. This was considered a mere coincidence for the longest time, and often cited as the reason for the inability to pen down women’s history. Male space as political and thus public; and female space as personal, and hence private, were unquestionably put aside as two binaries. The two did not meet except on occasion. This is why early modern portrayal of the harem remains highly sexualized from Oriental writing onwards, until very recently. Empress intervenes by undertaking a feminist reading of the existing sources to uncover the history that exists. ‘Nur is there, it turns out; all we have to do is to look for her, which sometimes entails peering around the towering figures of men’ (p. 249). Ruby Lal postulates the question as to what counts as evidence, and therefore history (p. 247). She elaborates revisiting Gulbadan Banu Begum’s rarely consulted memoir Ahval-i Humayun Badshah, to understand the imperial household and its other aspects, as the world Nur and Jahangir came to inhabit (p. 248). Apart from that there is Jahangirnama (Emperor Jahangir’s memoirs), which has more than thirty descriptive accounts pertaining to Nur Jahan, other contemporary and later Persian sources, foreign travellers’ accounts as well as royal orders issued by Nur Jahan, and a few lines of her poetry. Sunil Sharma’s work has already brought to attention Mer’at al-khial, a tazkera of 136 poets written by a Mughal official, Shir Khan Lodi in 1690-91, where Nur is mentioned (Sharma 2009, 153). It is not as if there have not been previous endeavours at writing the history of Mughal women, or even Nur Jahan. However, the works were deeply embedded in the perspectives of their times. We come across terms such as ‘Petticoat government’ used by Vincent Smith, not for Nur Jahan, but in general for the influence women exerted in the background in Akbar’s court (Smith 1917). Not only is it extremely problematic, but reduced women’s political ambitions to mere harem intrigues. It was Beni Prasad who initially gave attention to Nur Jahan, as Jahangir’s consort, in his biography (Prasad 1922). Even Jahangir has not been portrayed in the complex way he ought to be, and his memoir not given due scholarly attention, until recently. Although Beni Prasad does portray Nur Jahan as a part of the political coterie (junta), it is against the backdrop of the popular trope of a weak, opium addict ruler whose wife then takes charge of power. EB Findly’s work in the early 90s attempted an entire text on Nur Jahan. However, it started as an earnest ‘attempt to recover Nur Jahan’s lost reputation’ (Findly 1993, 06). Empress however, seeks to write a biography, retrieve the personhood, and write the history of a woman who it claims nurtured a political ambition of consolidating her power. Lal actually goes on to claim Nur’s ascent to the position of a co-sovereign, as ‘no other woman in Mughal India had embodied power through official signs of sovereignty such as issuing important orders under her own signature (p. 142). She signs as Nur Jahan Padshah Begum, and not in a familial role as women did before and after her. The book does not shy away from calling itself creative, but for me as a historian who works on women’s history, its creativity lies only in the way in which, their voices are retrieved by contextualizing them. Imperial dynasty and spiritual connect as central to understanding the political legitimization of Islamicate empires in South Asia has been attempted by various scholars—Sunil Kumar, Harbans Mukhia, Stephen Blake, Stephen Dale, Lisa Balabanlilar and Afzar Moin among others. Ruby Lal attempts something similar when she puts together the historical context, cultural milieu, social norms, and gendered boundaries of the heavily Persianized Mughal empire, as she sketches the personhood of Nur Jahan against this backdrop. The fantastical records and myths of Nur Jahan’s birth coincide with a turnaround in her family’s fortunes as they migrated to Hindustan in search for ‘not only material comfort but the hope for freedom of thought’(p. 19). Similarly, the book situates Nur against the circumstances and personalities of people who certainly contributed to the life she lived. However, the book offers a careful, layered, and complex understanding of Nur Jahan’s rise to power, without vilifying her political aspirations. Instead, it highlights various aspects of her personality—her political acumen, agency, concern for daughter, love and a certain playfulness with Jahangir—all find mention here. The work brings out how both Jahangir and Nur Jahan, were acutely aware of the sphere of power they were creating together. The Mughal association with light was not new, with both political as well as spiritual connect; and the term light, interestingly is present in both their names. Lal highlights these aspects to emphasize the unique position held by Nur. ‘The Light-enhancing garden (Nurafza Bagh) of Srinagar became another emblem of the Emperor’s connection to Nur, a way for Jahangir to honour their common name and joint rule. And the trend would continue’ (pp. 159-160). Lal, Ruby. 2005. Domesticity and Power in the Early Mughal World . New York. : Cambridge University Press. Sharma, Sunil. 2009. ‘From Aesha to Nur Jahan: The Shaping of a Classical Persian Poetic Canon of Women.’ Journal of Persianate Studies 2, 148-164. Smith, Vincent. 1917. Akbar, The Great Mogul, 1542-1605. Oxford: Clarendon Press. Prasad, Beni. 1922. History of Jahangir. Allahabad: The Indian Press Pvt. Ltd.
Findly, Ellison Banks. 1993. Nur Jahan, Empress of Mughal India. New York: Oxford University Press. Ruchika Sharma is Assistant Professor in the Department of History, Gargi College, University of Delhi, Delhi.